In his proposed 2020 budget released Monday, President Donald Trump indicated there would be major cuts in domestic programs and boosts to spending at the Department of Defense. Trump is also calling for 5 percent cuts to non-defense spending. Under the plan, the Environmental Protection Agency would see a 31 percent decrease in funding, the Education Department would take a 12 percent cut and the Department of Energy an 11 percent decrease. Here are some highlights from the White House's proposal. 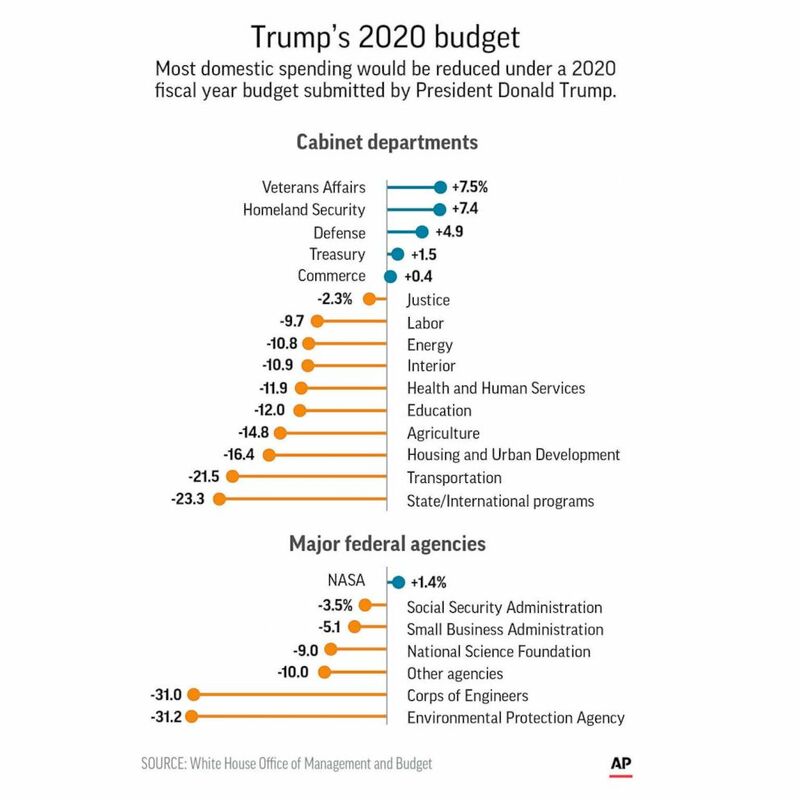 An AP graphic charts changes to cabinet department and federal agency budgets in President Trump's proposed 2020 fiscal year budget. The proposed budget contains massive cuts to the agency overall and various environmental programs. According to the proposal, the cuts are to "voluntary and lower-priority activities," so that the agency could focus on finalizing replacements to Obama-era policies, improving the agency's toxic chemicals program, cleaning up contaminated sites, helping communities remove hazards at schools like lead and asbestos and providing more money to improve water infrastructure. - $10 million in infrastructure programs to improve waster facilities along the U.S.-Mexico border. Local programs focused on the Chesapeake Bay and Great Lakes face 90 percent cuts to their budgets. In previous years Congress has rejected similar cuts and kept EPA's funding mostly consistent or increased funding for some programs. Trump's budget proposal hits the State Department again with deep cuts, even after Secretary of State Mike Pompeo promised to get the department's "swagger" back and "get the team on the field." This is the first proposal under Pompeo, but the budget still calls for a nearly 24 percent decrease in funding for State and USAID. The proposal provides an additional $13.6 million for human resources and $11 million for the Foreign Service Institute, which trains diplomats. However, despite the department's empty senior positions and chronic vacancies overseas, as documented in a new government report, the budget proposal largely keeps staff levels even, according to budget director Douglas Pitkin. The cuts instead would come from U.S. contributions to international organizations like the United Nations, peacekeeping missions overseas in places like Darfur and Haiti, global health and refugee programs and a reorganization of USAID and how it distributes humanitarian assistance. Those have been part of Trump's foreign policy for two years now, although other positions are contrasted by the budget request: While Trump has threatened to slash aid to Central American countries over immigration, the budget proposal calls for increased economic assistance to enhance "governance and boost local economies to discourage illegal immigration," according to Deputy Secretary John Sullivan. Last month, Trump announced a new initiative to "defeat AIDS in America and beyond," yet his budget calls for major cuts to programs that treat and combat HIV/AIDS overseas. Congress has rejected these proposed cuts for the past two years when Republicans controlled both chambers. Now, with Democrats in charge of the House, this year's proposal is even less likely to be enacted. Rep. Eliot Engel, chair of the House Foreign Affairs Committee, has already released a statement calling it "dead on arrival." Trump wants the government to cut some $1.4 trillion in the next 10 years from federal Medicaid spending and shift most of that money to state-run grant programs. The federal program provides medical assistance to millions of low-income and disabled Americans and the move would essentially wipe out the expansion effort led under President Barack Obama, in favor of limited block grants. 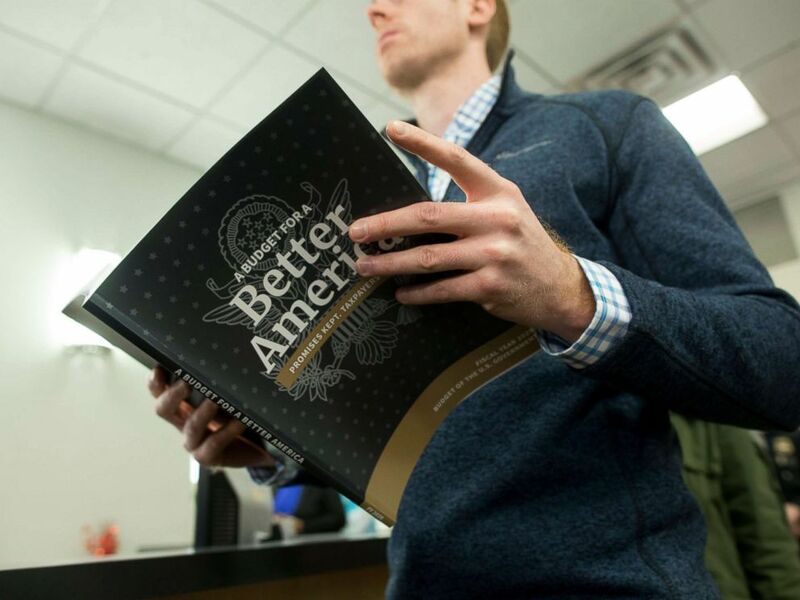 A member of the public waits in line to purchase a copy of President Donald Trump's budget for the fiscal year 2020, at it's release at the Government Publishing Office bookstore in Washington, March 11, 2019. The budget proposal aims to ramp up immigration enforcement on the border and within the U.S. In addition to $8.6 billion more for the border wall, the plan would fund 5,000 new Border Patrol Agents, allow Immigration and Customs Enforcement to add 10,000 officers and investigators and expand detention centers, according to the White House budget office. When Trump first came into office, ICE facilities held an average of 34,376 people on any given day. Last week that number topped 50,000 and the new proposed budget would allow for further increases. The Trump administration’s efforts to crack down on these jurisdictions have been stopped by appellate courts multiple times. The proposal would also increase Justice Department funding to grow the number of immigration judges by nearly 20 percent, the budget office says. The judges face a record backlog of cases, made worse by the government shutdown earlier this year. The Trump administration is looking to cut $7.1 billion from the department compared to what it was given last year. The cuts would include eliminating 29 programs that "do not address national needs, duplicate other programs, are ineffective, are poorly targeted, or are more appropriately supported by State, local, or private funds." You can read more about the proposal for the Education Department here. ABC News' Stephanie Ebbs, Conor Finnegan, Anne Flaherty, Quinn Owen and Sophie Tatum.